As you likely know, the biggest change you face when you get put on a restricted diet is that buying prepared or processed foods of any kind becomes nearly impossible because of the amounts of sodium, sugar and fat in them. You are forced to cook for yourself, learning if you haven’t cooked before or relearning if you had cooked but used the big three of forbidden foods that you can no longer eat. I’ve been a cook all my adult life but have been relearning and refining old recipes to get the salt, sugar and fat out, as I write about here. I pretty much make everything from scratch now and after eight months of doing it, have a fairly good rotation of nightly dinner dishes which I make for my wife and I. But cooking from scratch every night is time consuming, and tiring after long, long days at work. That’s why I recommend cooking several main courses at once, perhaps on a Saturday or Sunday when you may have more time to prepare. Then you can simply reheat these items and make some quick veggie side dishes during the week. I did that with the items in the picture you see here. Cooking three, or more, meals at once. The center item is my latest take on a pizza I can eat. It’s made with a whole wheat prepared crust from Whole Foods, salt-free tomato sauce and fat-free mozzarella cheese I get from a local supermarket, along with peppers, low-salt black olives, and mushrooms. To the right of the pizza is my turkey meatloaf, which includes two pounds of lean and very lean ground turkey combined with low-salt Panko bread crumbs and Eggbeaters (equal to one egg). A meatloaf that size is at least two meals for my wife and I, and easy ones to quickly heat during the week. 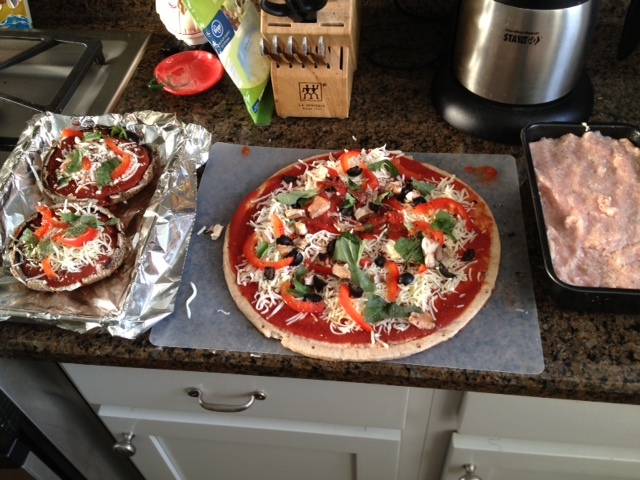 To the left are portobello mushroom caps covered in salt-free tomato sauce, no-fat cheese and peppers. I originally cooked these as a main course but we ended up having them as a side dish. Simply bake those at 350 degrees for about 20-30 minutes depending on your oven. How Much Salt is in a McDonald’s Premium McWrap? 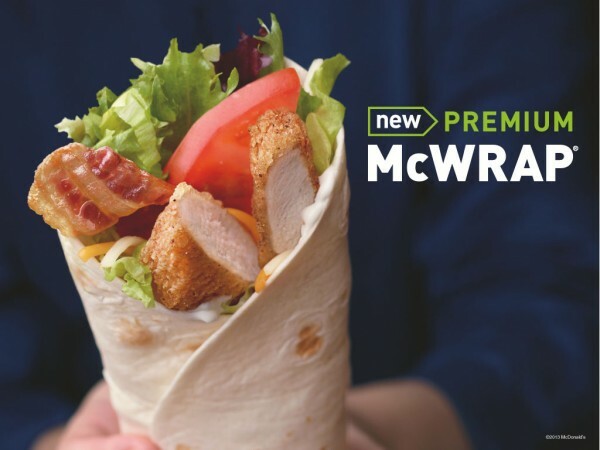 McDonald’s has been getting a lot of advertising mileage out of its new Premium McWraps, touting them as healthy offerings. But how healthy are they if you’re on a restricted diet, specifically if you’re on a no-salt diet as I am? Unfortunately, not very, according to nutrition information on the McDonald’s website. A premium chicken McWrap with grilled chicken and ranch sauce has 1,130 mgs of sodium. I’m not supposed to have more than about 1,200 mgs a day, so one of these new McWraps would be a day’s salt for me. That’s unacceptable, and should be for you too if you’re watching your salt. Order it without the cheese, and you’re still at 1,030 mgs, still way too high. Leave off the ranch sauce and you’re down to 930 mgs, still more than half a day’s sodium. Please McDonald’s, I want to be able to eat at your places again, you’re everywhere, no place is more convenient for a quick lunch. But all I can order these days is a side salad without any dressing. I carry my own oil and vinegar to avoid your high-sodium dressings. Please get the salt out.